Managing SQL Server 2008-2017 encryption keys with Alliance Key Manager (hardware security module (HSM), VMware, Cloud HSM, or cloud instance) is the best way to ensure encrypted data remains secure. Key Connection for SQL Server stores encryption keys separately from the database server on a secure key manager to meet PCI-DSS, HIPAA/HITECH, GLBA/FFIEC, and other compliance requirements. In addition to managing TDE and cell level encryption keys, Alliance Key Manager offers an on-board encryption service - the key never leaves the server. Further, Townsend Security enables customers to encrypt SQL Server databases—including 2008-2017 releases—as well as Oracle, IBM DB2/400, MySQL, MongoDB, and more. Cost should not be a barrier to compliance. Our key management model is built to scale from a single server to a multi-server environment. Any organization can now deploy a cost-effective, comprehensive and certified solution to meet key management compliance requirements. Meet encryption key management best practices with separation of duties and dual control. Store encryption keys separately from the encrypted data on your Microsoft SQL Server with a secure and compliant encryption key management solution. Enforce separation of duties and prevent administrators from having access to SQL Server data and the encryption keys to meet compliance standards. 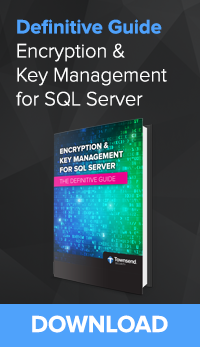 Townsend Security’s encryption key management solution connects effortlessly to the SQL database. It utilizes Microsoft’s (EKM) interface to support both Transparent Data Encryption (TDE) and Cell Level Encryption on Microsoft SQL Server 2008-2017. Our Alliance Key Manager includes an unlimited license to use the Key Connection for SQL Server software. Key Connection for SQL Server is an Extensible Key Management (EKM) Provider that installs in your SQL Server environment to support both Transparent Data Encryption and Cell Level Encryption. Save time while addressing compliance requirements for key management. Automate all of your essential key management tasks including rotation, retrieval, and generation, for one server or many, in a central location.